Smokey Chicken Tikka Biryani Recipe with step by step instructions.తెలుగు వెర్షన్. Tried this recipe for the first time and came out really good. 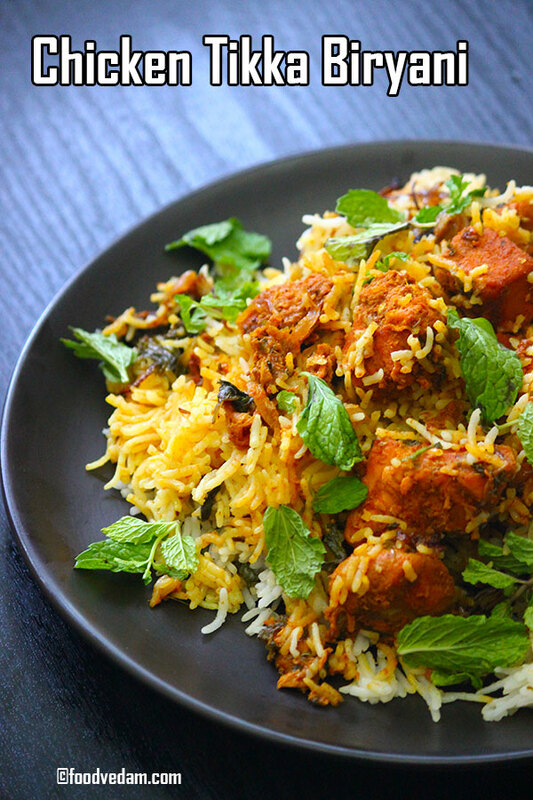 we can try this chicken tikka biryani when we get bored of regular biryanis. it’s a bit time taking but worth spending. and the highlight of this recipe is the smokey flavor of the chicken tikkas. 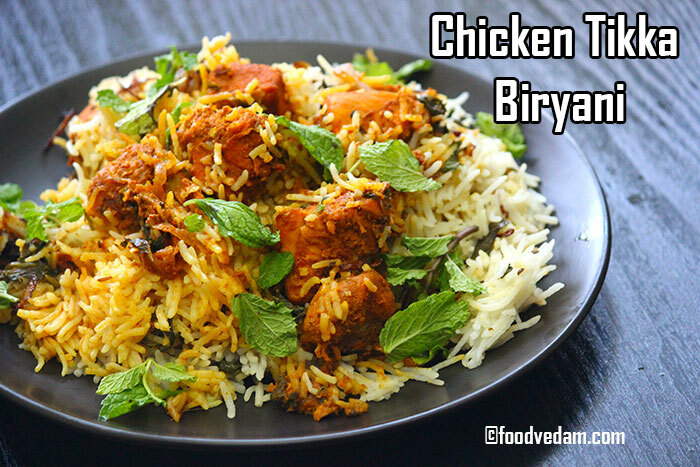 For regular biryani, we first marinate the raw chicken with all the biryani masala ingredients. here in this recipe, we first need to prepare chicken tikkas and then cook them along with biryani masala ingredients. if we marinate the chicken with chicken tikka masala on the previous day and keep in the refrigerator the next day we can directly put them on the pan and make chicken tikkas. this saves some time. simultaneously, we can also cook rice. for this recipe, I didn’t follow the conventional way of half cooking rice and straining out the water. I cooked rice in the electric rice cooker instead. but turned off the cooker when the rice 90 percent done and it still has some moisture. then added to the chicken tikka marinade. here again, it saves some more time. you can see the procedure in the video below. I hope you definitely try this mouthwatering recipe. and please don’t forget to leave a comment when you try. and more thing to say don’t forget to give a smokey flavor to the chicken tikkas. that makes you feel really important once try this recipe :). ఈ రెసిపీ తెలుగు వెర్షన్ కొరకు ఇక్కడ క్లిక్ చేయండి. Take a mixing bowl, add salt, turmeric powder, dried red chili powder, tikka masala powder, orange-red food color, ginger garlic paste, thick yogurt and mix well. Add boneless chicken pieces and mix again. leave for an hour. Soak basmati rice for in water for 30 minutes. Rinse the soaked basmati rice for 2 to 3 times and take it into a bowl that comes with an electric rice cooker. Add water, salt, bay leaves, Shahi jeera, cloves, cardamom, nutmeg, mace, black cardamom, mint leaves, coriander leaves, ghee, mix well and taste it. Add salt if required. Put the bowl in the electric cooker and switch it on. Cook until the rice is 80 percent done or switch off when the rice has still some moisture. You can do this simultaneously while cooking rice. Heat a pan and add oil. when the oil is hot add marinated chicken tikka pieces, mix well cover and cook until the chicken becomes tender. Mix the pieces in between. Turn off the flame when the chicken pieces are done. Make a space in the center of the pan and place burnt charcoal pouring a little oil on it. You can see the smoke coming out and spreading. Cover it with a lid immediately and keep aside until the smoke disappears. Take a heavy bottomed vessel and pour oil. When the oil is hot, add cinnamon, cloves, cardamom and sauté for a minute. Add green chilies, thinly sliced onions, salt and sauté until the onions turn light brown. Add ginger garlic paste, turmeric powder, red chili powder, biryani masala, medium thick yogurt, mint leaves, coriander leaves, lemon juice and mix well. Cook on a slow flame until the oil separates. Then take out half of the gravy along with the pieces and keep aside. Add half of the 80 percent cooked basmati rice and spread it evenly. add some mint leaves, coriander leaves, fried onions, ghee. Put the remaining gravy on top of the rice layer and repeat the process with the remaining boiled rice. Cover the vessel with a damp cloth or an aluminum foil and place the lid. Cook on a very slow flame for 10 to 15 minutes and turn off the flame. Leave for 15 to 20 minutes and serve.